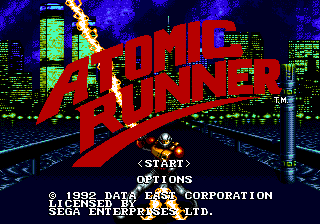 Atomic Runner, known as Chelnov (チェルノブ) in Japan, is a 1988 arcade game by Data East ported to the Sega Mega Drive in 1992. 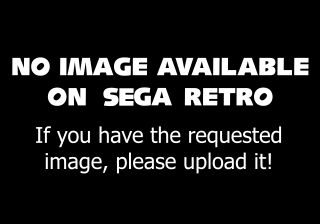 The Mega Drive version of the game has since been released for the Wii's Virtual Console service in Japan. The original arcade version's plot was completely replaced in the Mega Drive version due to the controversy it caused. Instead of a coal miner who developed superhuman abilities after getting caught in Soviet nuclear failure and must now fight the evil organization who wants to hire him for his powers, Chelnov is now a scientist living happily with his father and sister Chelmi. One night, he goes out for a jog only to hear an explosion at his house. Racing back home, he finds his father near-death at the hands of the "Deathtarians," a group claiming to be the original intelligent life — and consequently, the true owners — of planet Earth, predating humans. Chelnov's father had been working to try to stop the Deathtarians, and now he leaves a suit which grants its wearer superhuman abilities and numerous weapons to Chelnov. Chelnov donned the suit to become the Atomic Runner and went on his way to save the world and rescue his now-kidnapped sister, but was overwhelmed by the Deathtarians's numbers. The Deathtarians captured, tortured, and attempted to brainwash the Atomic Runner, but eventually failed, leaving him with one last attempt to stop the Deathtarians. Chelnov always runs forward. Should there be need for him to stop, hold ; the screen will continue to scroll to the right and he will start moving again if he touches the edge of the screen. jumps. fires a laser beam; there is rapidfire when the button is held down and shots can be aimed with the directional pad (but you cannot shoot straight up). Holding and pressing or causes the player to run backward or forward, respectively. The player dies when hit once. Main article: Atomic Runner/Magazine articles. Atomic Runner, in its original arcade form was once set to appear for the Sega Saturn. It appeared at the Tokyo Game Show and various game stores in the Akihabara district of Tokyo in 1997, though was canceled for unknown reasons. A prototype has since been leaked onto the internet.